For sites that have good solar potential, we strongly recommend that you get at least two bids from contractors. Once you have the bids, we are happy to help you evaluate your options. To participate, contact Dana Armanino or phone her at (415) 473-3292. The Marin Solar Program is an outreach and education effort administered by the County of Marin Community Development Agency. The Program does not participate in the design, purchase or sale of photovoltaic systems. For information on photovoltaic systems, please visit our Photovoltaic Basics page. For an extensive list of financial incentives and programs throughout the Country, check the Database of State Incentives for Renewable Energy (DSIRE). Identify your home's solar potential with the Project Sunroof tool from Google. This tool uses Google Maps satellite images to analyze roof space and inform property owners if their roof is ideal for a solar system. Visit MCE's website for more information on their feed-in tariff for solar. If you plan to construct a solar energy system in the unincorporated areas of the County, you will need to obtain a building permit from the Community Development Agency's Building and Safety Division. To help with this process, they have created code reference guidelines, an express permitting system and e-Inspection process to assist you with your project. Visit the Building and Safety Divisions Forms and Applications page to access all the resources. If you are constructing a solar energy system in one of Marin's cities or towns, please contact their Building Office directly. Below are links to the main building department pages for Marin's cities and towns. Marin County is taking actions to make the solar permit process as easy and cost-effective as possible. Visit the Solar Roadmap webpage to track our progress. Please visit our Energy Financing page for information about rebates, financing, grants and other financial incentives available to those installing solar systems. January 2009 (San Rafael, CA) SolarCraft Press Release: SolarCraft Completes Solar Electric & Solar Hot Water Systems for Marin Health & Wellness Campus Novato-based SolarCraft announced today it has completed the design and installation of a 53.4 kW solar electric system and five solar hot water systems for the new Marin Health and Wellness Campus in San Rafael, CA. Installing solar improves their state-of-the-art green building practices for design, construction and site operation. May 17, 2007 (Mill Valley, CA) SPG Solar Press Release: Throckmorton Ridge Fire Station Dedicates Solar Energy System and New Facility The Marin County Fire Department dedicated its new environmentally friendly, state-of-the-art Throckmorton Ridge fire station. The new station features a 38 kW solar photovoltaic (PV) system designed and installed by SPG Solar, Inc. of San Rafael, CA. In addition, the station also has a new geothermal system and a host of green building materials. The station replaces one that has served the department since the mid 1950's to better suit the needs of today's fire service. The station's solar energy system is made up of 232 Kyocera 200-watt modules and ten Fronius IG-4500 inverters and will provide over 40% of the station's annual electricity needs, with an expected production of over 67,000 kWh each year. With an inspiration to pursue a LEED (Leadership in Energy and Environmental Design) Gold certification, the station also features natural light and ventilation, green carpeting, flooring, insulation and structure steel and the implementation of a waste diversion program during its construction. The LEED certification process provides a format to create a project that is sustainable in a global sense as well as healthy and comfortable for the building occupants. "This station reflects two important goals of the County; to provide for a sustainable future and encourage community partnerships. From concept to completion, these values helped to drive the project forward," said Ken Massucco, Marin County Fire Department Chief. "Needless to say, this station will serve as a model for other fire departments to emulate across the State and country." 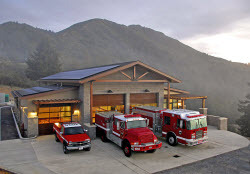 "We commend the Marin County Fire Department and Throckmorton Ridge Station for their commitment to the environment and to the community through their use of clean, renewable energy and abundant application of green materials. Over a 25-year period, the Throckmorton Ridge station is expected to displace over 2 million pounds of greenhouse gas emissions," said Dan Thompson, President and CEO of SPG Solar. Feb. 24, 2004 (San Rafael, CA) County of Marin Press Release: The County of Marin Fires Up Solar Powered Electric Plant The County of Marin, California announced today that its recently installed photovoltaic (PV) system is up and producing electric power. A formal dedication ceremony is scheduled for March 3 in the Frank Lloyd Wright Civic Center Board Chambers, located at 3501 Civic Center Drive in San Rafael. The ceremony, which begins at 10:30 a.m., will include a short presentation on Marin County's actions and commitment to energy savings and environmental protection and will feature guest speaker, Dr. Donald Aitken, recipient of the "World Solar Award" and affiliate faculty member of the Frank Lloyd Wright School of Architecture. Attendees are invited to tour the PV installation afterwards. The photovoltaic system, a SunRoof™ FS System, capable of producing up to 89 kilowatts - enough to power up to 30 homes - was installed on top of the County's General Services Building. "Our goal is to reduce County generated emissions, power usage and costs 20 percent by 2020," said Board of Supervisors President Steve Kinsey. During sunny days, the County's solar electric power system can produce more electricity than the garage complex consumes, allowing the county to receive a credit for electricity it sends back into the power grid. The annual balance between electricity produced and consumed is expected to reduce the facility's electric bill from about $24,000 a year to zero. 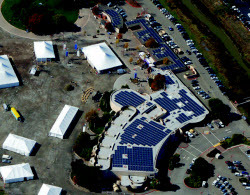 The County used RWE SCHOTT Solar, Inc. of Rocklin, a manufacturer and distributor of solar modules and systems, and Prevalent Power, Inc., a Novato-based renewable energy developer (now owned by Suntech Solar), to provide a non-penetrating flat-roof solar electric power system for the County. The project is a timely fiscal bright spot in a challenging funding year for the County. The $662,000 project cost is offset by a $324,000 rebate from PG&E's self-generation incentive program and an exceptionally low interest loan from the California Energy Commission, which will be repaid entirely with the annual energy savings from the new system. PG&E Vice President Anlin Ting-Mason said, "The Marin County Board of Supervisors' leadership and foresight have resulted in a facility that will provide benefits to the community for decades to come." Kinsey adds, "In addition to being a remarkable asset to the County Infrastructure this project is a beacon to other agencies and the public, showing the way to a more sustainable future." "As a Marin County-based company specializing in developing real-world power solutions, it is especially gratifying to contribute to the county's energy efficiency and generation programs," said Arno Harris, president of Prevalent Power. "They are a great example of thinking globally and acting locally and this PV installation does a great job of demonstrating the county's commitment to its goals." Marc Roper, director of sales for RWE Schott Solar added, "We are proud to be a part of the team that is helping Marin County realize its economic and environmental vision. It is also gratifying to be able to work with our partner, Prevalent Power, and achieve such good results executing a complicated plan to deliver excellent products and service to our customer." 30% federal credit for solar electricity and solar thermal hot water (not pool heating). The tax credit is currently available through 2016. More information and instructions on how to apply can be found at Energy Star Tax Credits. For technical glossaries, visit the Renewable Resource Data Center. The parts of the photovoltaic system other than the PV array: switches, controls, meters, power-conditioning equipment, supporting structure for the array and storage components, if any. Batteries are often sold with a PV system. The primary purpose is to store the electricity not immediately used, which could be used at some later time. With net metering, the value of batteries is less because the utility grid basically acts as a storage facility. For a reliable generation system that can function independent of the utility grid, however, batteries may be a viable component to the total system. Back-up generators may be included in a system to provide power when the PV system is not operating, and are generally included when systems are not grid connected. Neither batteries nor generators are eligible for rebate money. A term for the design and integration of PV into the building envelope, typically replacing conventional building materials. BIPV often integrates PV cells into vertical facades, such as in window glazing; into roofing systems, replacing traditional roofing materials and into shading structures that cover windows. A key part of the DATA COLLECTION SYSTEM which has the function of collecting analog and digital signals, converting the analog signals to digital, multiplexing the signals, doing arithmetic and logical operations, and storing measured and calculated values. Depending on the specific manufacturer's model, the DAS may have its own display and printing devices built in (e.g., data loggers). A complete system for collecting, analyzing, storing, and displaying measured and calculated data. It consists of sensors, signal conditioning, cabling, and the DAS. A PV array using non concentrating modules with a flat surface for collecting solar energy. The network of ac power transmission lines and transformers used in central power systems. Grid power means utility power. Grid-connected or utility-interactive PV systems are designed to operate in parallel with and interconnected with the electric utility grid. The primary component in grid-connected PV systems is the inverter, or power conditioning unit (PCU). The PCU converts the DC power produced by the PV array into AC power consistent with the voltage and power quality requirements of the utility grid, and automatically stops supplying power to the grid when the utility grid is not energized. A bi-directional interface is made between the PV system AC output circuits and the electric utility network, typically at an on-site distribution panel or service entrance. This allows the AC power produced by the PV system to either supply on-site electrical loads, or to back feed the grid when the PV system output is greater than the on-site load demand. At night and during other periods when the electrical loads are greater than the PV system output, the balance of power required by the loads is received from the electric utility This safety feature is required in all grid-connected PV systems, and ensures that the PV system will not continue to operate and feed back onto the utility grid when the grid is down for service or repair. A PV system that includes other sources of electricity generation, such as wind, microturbines or diesel generators. An agreement entered into with the local utility (PG&E) allowing for net-metering a photovoltaic, wind or fuel cell system to the utility grid. A power conversion device which changes dc voltage input to an ac voltage output. A power conversion device which changes dc voltage in Grid-connected or utility-interactive PV systems are designed to operate in parallel with and interconnected with the electric utility grid. The primary component in grid-connected PV systems is the inverter, or power conditioning unit (PCU). The PCU converts the DC power produced by the PV array into AC power consistent with the voltage and power quality requirements of the utility grid, and automatically stops supplying power to the grid when the utility grid is not energized. A bi-directional interface is made between the PV system AC output circuits and the electric utility network, typically at an on-site distribution panel or service entrance. This allows the AC power produced by the PV system to either supply on-site electrical loads, or to back feed the grid when the PV system output is greater than the on-site load demand. At night and during other periods when the electrical loads are greater than the PV system output, the balance of power required by the loads is received from the electric utility. This safety feature is required in all grid-connected PV systems, and ensures that the PV system will not continue to operate and feed back onto the utility grid when the grid is down for service or repair or put to an ac voltage output. Maximum generating capacity of photovoltaic system. Term used in performance rating of PV cells, modules, and arrays, usually at sunlight intensity of 1000 W/m2 with an average cell temperature of 25°C. Size of the photovoltaic system, based on the sum of the nameplate module wattages. The power of a PV system will be lower than the kilowatts DC due to dust and dirt, ambient temperature, conversion losses (going from DC to AC), wire losses, orientation, tilt and shading. The amount of kW produced over a period of time, or one kilowatt of electricity supplied for one hour. For example, a one kW system, if operating at full capacity for 5 hours will produce 5 kWh of electricity. One thousand kilowatts or one million watts. One megawatt is enough to power 1,000 average California homes per day. Net Metering is a billing arrangement between Pacific Gas & Electric and customers who generate their own electricity with photovoltaic or wind systems, by which the excess electricity produced using your own generating equipment is fed back onto the utility grid and is deducted from your electric bill. System installed in households, typically in remote areas, that are not connected to the utility grid. Requires a means to store electricity (most commonly a lead-acid battery). Also called "stand-alone photovoltaic power system". The amount of electricity a PV system produces. Dust and dirt, ambient temperature, conversion losses (going from DC to AC), wire losses, orientation, tilt and shading all effect the output of a PV system. A device that produces electricity from light. Cells are the building block for modules. A number of PV cells connected together, sealed with an encapsulant, and having a standard size and output power; the smallest building block of the power generating part of a PV array. A group of photovoltaic panels. Silicon which has solidified rapidly enough to produce many small crystals which are arbitrarily arranged. This type of cell has grain boundaries, randomly oriented, visible on the active surface. Compare to Monocrystalline Silicon and Amorphous Silicon. A type of PV system that is not connected to an auxiliary power source or a PV system that operates independently of the electric utility lines. It usually contains one or more batteries, but many pumping systems comprise only the PV array and the inverter. Also known as an "off-grid PV system"
Storage refers to saving surplus electricity produced by a PV system. Generally batteries are used as storage devices. The angle which the plane of a PV module makes relative to the horizontal plane. Structure that houses PV modules and that can automatically follow the sun across the sky throughout the day to maximize output. Typically refers to a solar contractor that handles most/all of the stages of a photovoltaic installation, including design, engineering, product supply and installation. A unit of measure of the force, or 'push,' given the electrons in an electric circuit. One volt produces one ampere of current when acting on a resistance of one ohm.